As sweet as cinnamon: Candy Cane Cookies! Yum Yum.... 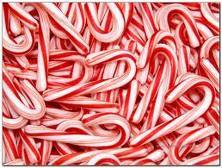 I just love Candy canes... that subtle peppermint taste. Crushed candy canes for decoration. Beat butter, castor sugar and egg together. Stir in flour with a wooden spoon. Take tablespoons full and roll into little balls. Cool cookies on trays then transfer to rack. Yum Yum - Thanks dawnie. Dawn, those cookies are enough to make me give up my vow not to bake this holiday season! Mercy, you're trying to make me fat, lol! These sound delicious, thank you! Thanks for sharing your recipe! My daughter will love making these!